2017 is on pace to boast the second –LOWEST national crime rate since 1990, with near record low murders. Overall crime nation-wide is projected to drop by almost 2%, the second lowest since 1990, violent crime projected to fall by 0.6%, the second lowest point in 25 years. But here in St. Louis it’s quite the opposite. 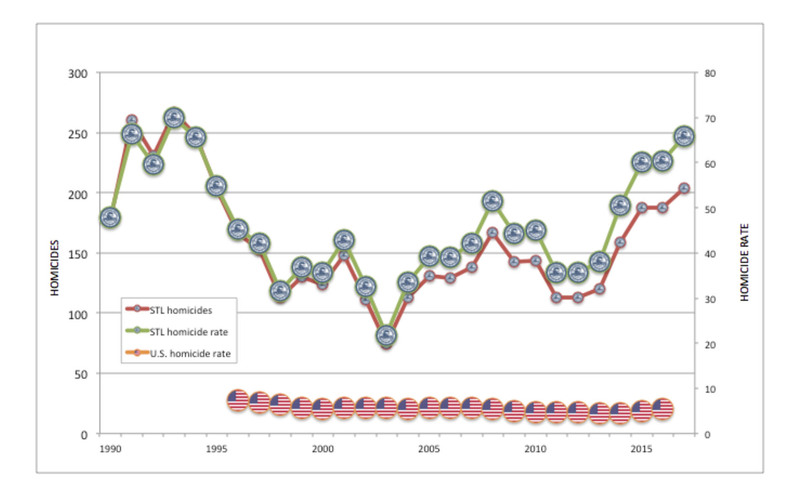 We were on pace for the second-HIGHEST homicide rate since 1990 until the cold snap hit, even with the slow down in crime, we haven’t seen rates this high in decades. Overall crime is up YTD 1.1% as of November and even more alarming, person crimes are up 7.6% and homicides are up 11% year to date. But crime isn’t up everywhere in the city. 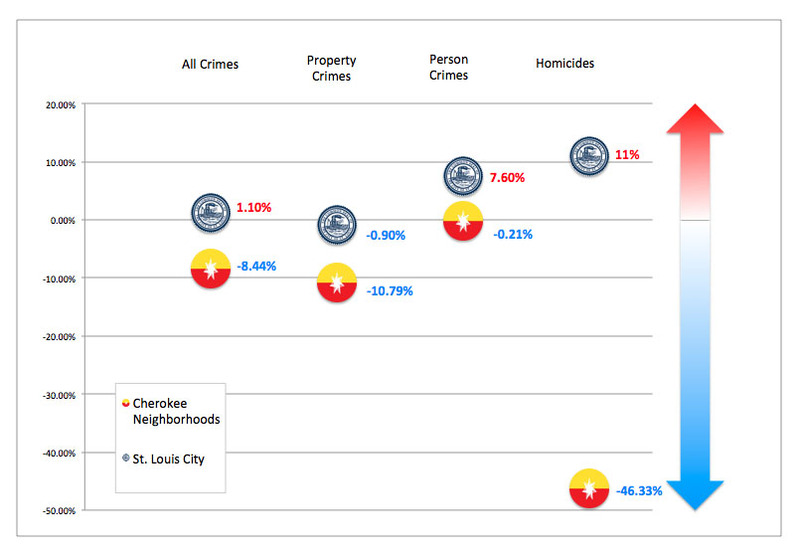 In fact, crime is down significantly in some of the southside neighborhoods with the most crime historically. The same neighborhoods that have the most density and diversity, the most poverty and vacancy. So what’s driving this remarkable decrease? According to Citylab, the great crime decline that the most major American cities have seen over the last 25 years can be attributed to community grassroots efforts like building playgrounds and employing young men. 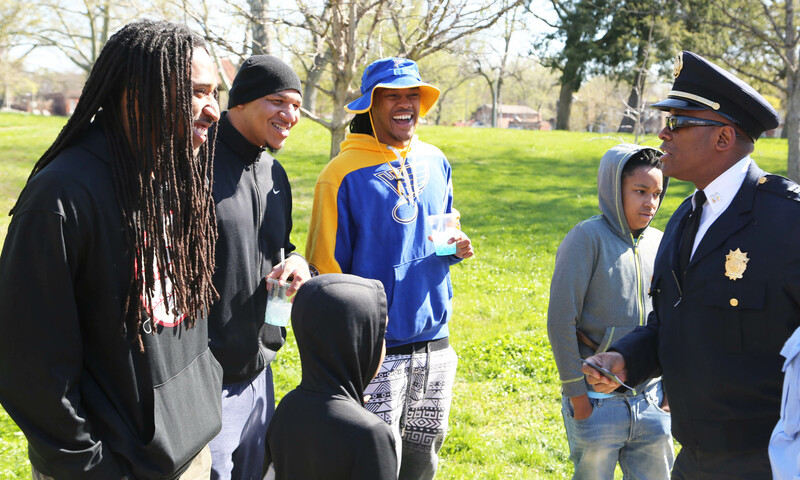 Earlier this year, Gravois Park and Benton Park West neighbors worked with the Cherokee Business District to apply for and install a brand new playground donated by New Balance. And for the last several years, this community has been a top employer for STL Youth Jobs, putting our young men and women to work. The Washington Post yesterday points to community policing and establishing closer ties with people living in violent neighborhoods. 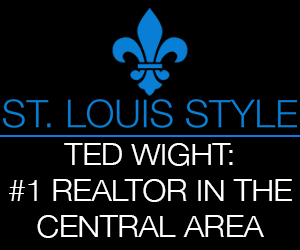 The Cherokee neighborhoods are unique in the City in that we have two SLMPD beat officers assigned to do just that. Not paid by a special Community Improvement District. Not overtime answering to a particular neighborhood association or business. Officers Garrett and Jackson are assigned by 3rd District Shawn Dace to patrol all 4 neighborhoods, to get to know the kids, the neighbors, the community as a whole. And they do an excellent job. Yesterday, our City appointed a new Police Commissioner, Chief John Hayden who described building citizen trust through “having outdoor roll calls in struggling neighborhoods, by attending community meetings and seeking feedback, but most importantly by walking the streets and talking to our citizens face-to-face.” As we struggle to keep our beat officers in place, a new commander in chief with these priorities gives me hope. 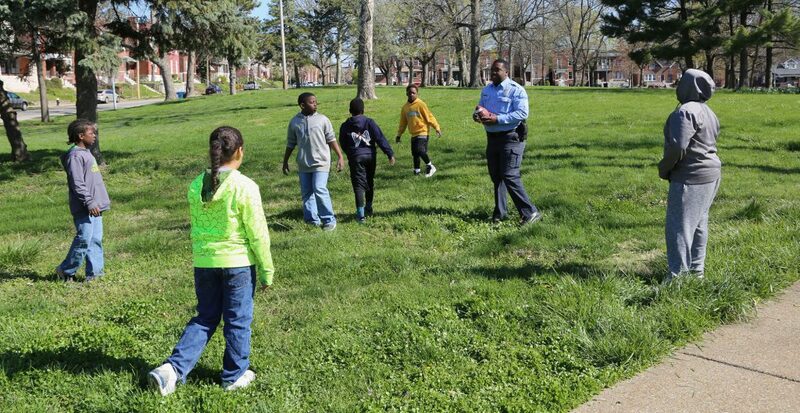 While two beat cops and a playground are no panacea, and we still have crime issues, we should take seriously the impact community and community policing has on the crime rates in our neighborhoods. The small yet significant strides we have made in the Cherokee neighborhoods should be not only nurtured but used as a model city-wide. As many of our nation’s major cities are learning: community makes all the difference.